The Ferienhof Faust offers extensive accommodation of various types and is a truly unique place to spend a holiday. Located in a small village in the centre of the Hunsrück region, the Faust ‘holiday farm’ provides the perfect setting for parties and celebrations of all kinds. 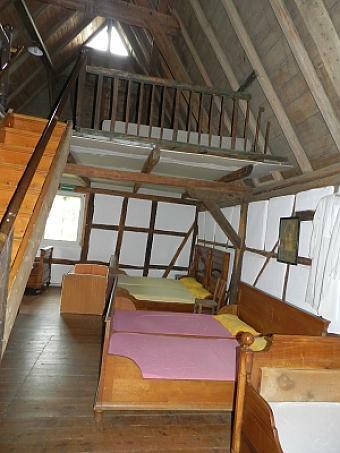 The holiday apartments, houses, guestrooms and the hayloft hostel occupy various locations around the town of Weiden and all have access to extensive outside areas. The Ferienhof’s diverse range of accommodation options means that there is a unique and attractive package to suit every budget. A total of 38 beds (and 7 cots) in 4 holiday apartments, 2 holiday houses and 2 guestrooms Some of the accommodation is wheelchair-accessible, all of it is non-smoking and can be booked in any combination. There is also accommodation for approx. 70 people, sleeping either in the hayloft or in shared rooms. 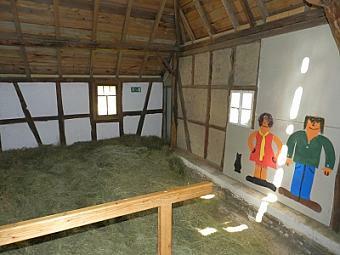 The Ferienhof is therefore an ideal place for families or groups to stay. The accommodation is decorated in elegant style, yet retains its country house ambience and is furnished with a delightful combination of antiques and more modern pieces. This attention to detail and the stunning flowers and plants to be found everywhere make this a perfect place to ‘get away from it all’ – what you might call a real “home from home”. Immerse yourself in these truly authentic country surroundings and experience a holiday with friends you will never forget! Those who enjoy hiking, cycling, motorcycling, collecting minerals, Nordic walking or angling. It is also a great place for dog-owners or those who enjoy horse-riding (we are on the “Hunsrück on horseback” riding trail). This is also an ideal place for families with children (who can enjoy a stay on an organically-run farm) as well as groups who have something to celebrate or just want to spend some time together. All guests (whether staying for just one night or coming to spend the day with us) are welcome to come and enjoy the many attractions, natural beauties and sporting challenges which this fantastic holiday region has to offer. There are great walks here, for example the Sirona-Weg, Soonwaldsteig, Ausoniusweg und Saar-Hunsrück-Steig trails, not to mention the premium hiking trails around Weiden. Or, if cycling is your thing, why not spend time out exploring on one of the many superb cycling routes such as the Schinderhannes and Hunsrück trails, and the Nahe-Hunsrück-Mosel and RadAktivRouten Hunsrück routes? We are very proud to have won the distinction of “most cycle-friendly accommodation of the month” in September 2010!